BioWare fixes an issue allowing players to overwhelmingly camp their opponents in an open-area PvP zone. In a rough few days after concerns about Star Wars: The Old Republic's viability caused EA's stock to slightly drop, and an apparent unsubscribe bug temporarily prevented players from cancelling their subscription, BioWare has managed to quickly correct a major PvP glitch in one of the game's open PvP zones. Caused by the game's first major update earlier this week, the glitch allowed Imperial players to rack up massive amounts of kills against their Republic foes by camping their spawn points and engaging them at point blank range. To correct the issue, players are now no longer allowed to enter opposing faction's bases, and if players dig through the patch notes, they'll also notice there are also indestructible turrets guarding each base to further discourage players from camping. 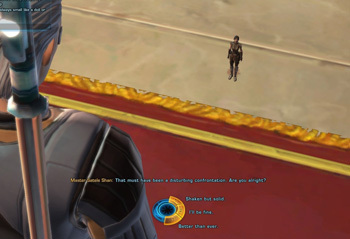 Additionally, BioWare lowered the population cap for the zone to help improve SWTOR's performance, limiting the amount of players who can be in the area at any given time. Currently there's no plan to "rollback" any of the rewards earned through abusing the glitch, but community manager Joveth Gonzalez did state that BioWare knows which players took "extreme advantage" of the situation and is looking into taking appropriate action.